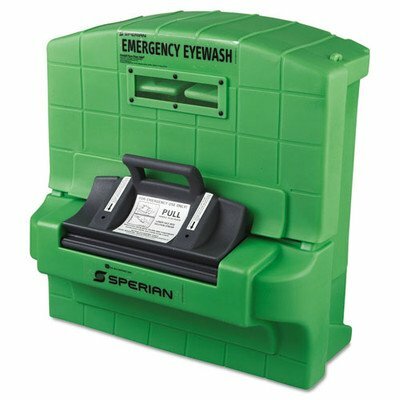 Pure flow 1000 eyewash station is a primary device that delivers Safety, reliability and value. The patented system delivers purified, contaminant-free and physiologically correct eyesaline solution from factory-sealed cartridges. The system does not require plumbing. It features a fluid pressure balancing system that provides a constant fluid flow rate and stream Height for the entire 15 minute flushing period required by ANSI Z358.1-2004. Nozzle design delivers a Soft Ribbon of eyesaline. Fluid reservoir Captures waste fluid to eliminate Spill hazards and simplify fluid disposal. Integral Valve at bottom of unit permits easy reservoir draining. Highly visible Green color makes system easy to identify in an emergency situation. Pure flow Factory sealed cartridges last up to 24 months.